Massive Crowds Call For Egyptian President's Ouster : The Two-Way The largest demonstrations so far against the Egyptian president's year-old government are being held. He says he won't give in to demands that he step down or call new elections. Some protesters, though, think Morsi will suffer the same fate as toppled President Hosni Mubarak. 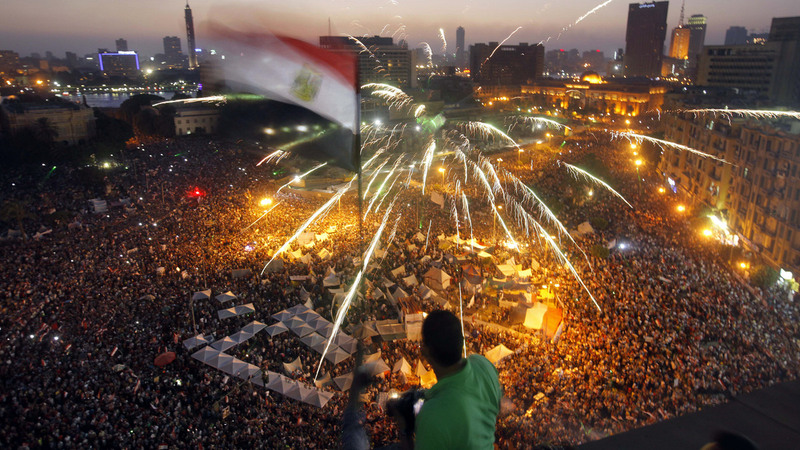 Egyptians gather in Tahrir Square during a demonstration against President Mohammed Morsi in Cairo on Sunday. Hundreds of thousands of Morsi opponents poured out onto the streets across much of Egypt, launching an all-out push to force him from office on the first anniversary of his inauguration. As Egyptians gathered Sunday in Cairo and other cities for what are expected to be the largest protests so far against the year-old government of President Mohammed Morsi, some in the streets were telling NPR's Soraya Sarhaddi Nelson that they expect he will be toppled in much the same way as President Hosni Mubarak was in February 2011. One protester told Soraya that Morsi is a "wounded lion in a corner ... if he attacks us, he loses ... if he doesn't attack us, he loses." At midday in Cairo, Soraya said on Weekend Edition Sunday, things were peaceful. But there were concerns that pro-Morsi Egyptians might clash with the protesters later in the day. Many eyes, she said, are on the Egyptian army. Its leaders have said they will "protect the will of the people." Protesters say that means the army will defend them, as it did at times during the Arab Spring protests against Mubarak. But Morsi's supporters say it means the army will stand up for the democratically elected president. As for Morsi, he's told The Guardian that he will not accede to demands that he step down or call a new election. "If we changed someone in office who [was elected] according to constitutional legitimacy — well, there will people or opponents opposing the new president too, and a week or a month later, they will ask him to step down," Morsi said. Soraya explained Saturday that much of the discontent about the president stems from the country's deep economic problems. "Gasoline at the moment is very hard to come by," she said. "It's about four dollars a gallon, if you can even find it. Food prices have gone up, so has cooking gas and everything else. So, there's been no relief for the people, which is what they seeking since toppling President Mubarak two years ago." The protests turned deadly on Friday. At least three people were killed in Alexandria, including Kenyon College student Andrew Pochter, 21, from Chevy Chase, Md. Another four people have reportedly also died in recent clashes. "Protesters in Cairo were marching toward the presidential palace and Tahrir Square, although Morsi was nowhere near either location. The scene was similar to the days leading up to Mubarak's forced departure in 2011. The protesters say Morsi's failed to fix the economy and given too much political power to the Muslim Brotherhood. Morsi's supporters armed themselves with sticks and staged their own rallies near the protesters. Fear of the two sides clashing is high, as there are no signs of Egyptian police or soldiers on the streets. A Morsi spokesman in a news conference renewed a call for national dialogue. His tone was softer than that of the president in recent days, who calls the protesters criminals and foreign agents." According to the BBC, "huge protests calling for the resignation of Egypt's President Mohammed Morsi and early presidential elections are taking place in the capital, Cairo, and other cities. Tens of thousands of opponents have massed in Tahrir Square and outside the main presidential palace. One man died when rival groups clashed in a city south of the capital. In Cairo, stones and petrol bombs were thrown at the headquarters of the ruling Muslim Brotherhood." "Hundreds of thousands of people across Egypt have filled the streets" to call for Morsi's departure, the Guardian now reports.